A delicious traditional beef pot roast that melts in the mouth. 1. 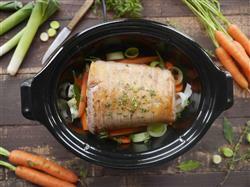 Place the joint in the Crock-Pot Slow Cooker stoneware and arrange the vegetables around the joint. 2. Mix together the wine or stock and tomato puree, pour over the brisket and cook on Low for 5-6 hours, or until the meat is tender and the vegetables are cooked through. 3. The meat juices will make delicious gravy. If thicker gravy is preferred mix a little cold water with some corn flour and a couple of spoonfuls of juice in a small pan, add the remaining liquid and bring to the boil to thicken. 4. Delicious served with mashed potato and buttered Savoy cabbage. If you're looking for something strong and simple to prepare in your Crock-Pot, it's hard to look beyond a traditional beef pot roast. This is the perfect way to prepare a joint of premium beef from your local butcher, and slow-cooking the meat will ensure that all the possible flavours are trapped within - only released when you bite into this delicious and tender dish, with the meat melting in your mouth to create a taste that you'll never forget. The key to this dish lies in combining the best possible beef with a delicious selection of vegetables - and, naturally, cooking them all together in a simple pot. Arranging these vegetables (we recommend the use of onions, carrots, swede and any herbs and seasoning of your choice - alongside a little tomato puree for a hint of sweetness) with the beef and leaving to pot ‘roast’ for around six hours will create a soft and delicious protein-packed main course. Perhaps best of all, you won't need to prepare any separate sauces or gravy for this dish - the juices released by the joint of beef during the cooking process will create the perfect complement to the meat, and can be poured over the top and used as gravy. Even if your tastes run to something a little thicker, this is easily achieved - simply apply some cool water and cornflour to these juices, and heat it up in the pan. Once you apply some creamy mashed potatoes and buttered cabbage to the side, you'll have a timeless recipe to reach for time and again!